West Brom defender Goran Popov has made an official apology for spitting at Tottenham's Kyle Walker. Popov, 28, was sent off during his side's 1-0 Premier League defeat on Sunday for spitting at the full-back. 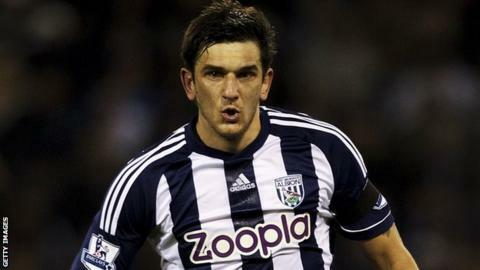 West Brom manager Steve Clarke said he was "disgusted" by the Macedonia international, who intends to make a personal apology to Walker. "I want to say sorry to all my friends, my team-mates and the coaching staff," Popov said. The incident happened two minutes into the second half of Sunday's match, with Popov tussling with Walker before spitting at him. Referee Mark Clattenburg saw it and immediately sent off the defender, who is on loan at West Brom from Dynamo Kiev. Popov admitted he had faced criticism from his own team-mates as well as his manager following Sunday's incident. "This is not good for me and I have not slept too well over the last two or three nights," said Popov. "Something like this has never happened before in my life. "The players were angry after the game, and some of them - the ones who have been a long time at this club - said they are disappointed in me." Popov also indicated he will attempt to contact Walker, who is with the England squad for Wednesday's friendly against Brazil at Wembley. "I'm trying to get a phone number for Kyle Walker but he is now with his national team," the defender added. "When I get his number I will call him and say 'I'm not like this, I didn't want to do this to him and a big sorry'. "Everyone can make mistakes, life is like this. Football is up and down. But Sunday was not good. When I saw it on the video after the game I saw that. "On Thursday I want to make a meeting and say sorry to everyone who works at this club. "I don't want all the fans, players, trainers and staff to change their mind about me. I'm not that kind of player."